The budding of an idea has created an explosion of sights, smells and sounds at Botanica Wichita. Experience the array of unique themed gardens created by generous local benefactors in the city. Discover the amazing tapestry of art and plants woven together in the Chinese garden to honor Wichita’s sister city Kaifeng, China. Your experience will include samples of floral teas and cookies. Tapping into the power of personal physiology to create confidence and well-being sets the tone for this unique experience at CityArts. Unleash your creative energy and design your own personal totem to connect you to your core energy and confidence. Exploration and innovation have played a significant role in Wichita’s success through the years. Discover the city’s global impact from aviation to architecture at Exploration Place. Pilot a drone, explore the pathways to invention and unleash your innovative spirit in CreatorSpace. Learn about the culture, history and traditions of American Indians at the Mid-America All-Indian Center. Uncover the history of native peoples, learn about the powwow traditions and enjoy a hands-on fry bread experience. Discover how Blackbear Bosin, an Indian from the Kiowa and Comanche tribes, united a community with his iconic Keeper of the Plains monument. Priceless artifacts from around the world create an amazing experience at the Museum of World Treasures. Hear the unique stories about the artifacts that will surprise and amaze. Go behind the scenes to learn about the collections and visit the curator’s space for a white-glove, hands-on experience. How do you create a town where none existed? At Old Cowtown Museum, encounter three pioneering citizens who contributed to the creation and development of Wichita in its early days. Discover how Wichita began as an outpost, became a Cowtown and grew into the thriving, largest city on the Plains. Be inspired and amazed during your backstage look at the Sedgwick County Zoo. You’ll discover what makes the zoo tick, how zookeepers care for the animals and how the zoo helps to save animals from extinction. During this adventure, you never know who you might meet along the way! Intimate animal encounters will connect you to the animal kingdom at Tanganyika Wildlife Park. Learn about Tanganyika’s success with species survival and breeding programs. Go behind the scenes to touch and feed the rare okapi or join the penguins in Trouble Maker’s Cove as they paint a beautiful masterpiece that you get to take home. Connect with the enterprising spirit of Wichita’s people who turned an outpost on the Plains into a major American city. At the Wichita-Sedgwick County Historical Museum, learn about the stories of exceptional pioneers, from settlement to aviation, who transformed this community and the world. You will meet one of them through a first-person interpretation! 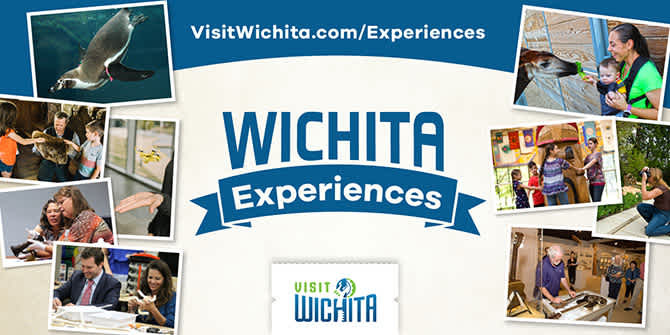 For more information on availability and pricing, visit https://www.visitwichita.com/experiences.